Battle Of The Somme Limited Edition Mini Lambeg Drum With Stand | Battle of The Somme : www.minilambegdrum.com, by Irish Shopper Ltd. This Mini Souvenir Lambeg Drum is in Memory of those who fought and died during the Battle of The Somme, 1916 to 2016 - 100 years . 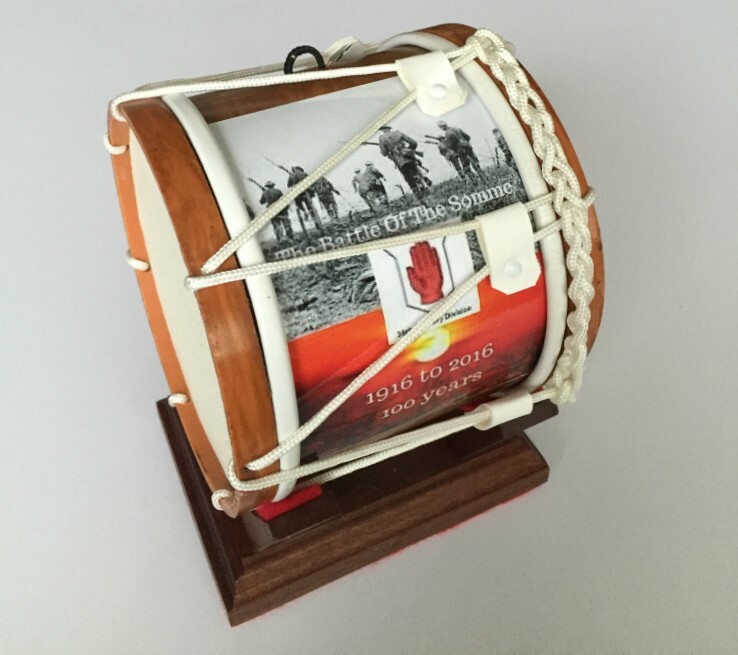 Each Battle Of The Somme Limited Edition Mini Lambeg Drum will have it's own mahogany display stand included . The Battle of the Somme encompassed a series of battles for the British Army in the sector of the Western Front south of Arras and north of the Somme River. The battle was launched on July 1st, 1916 following a seven day artillery preparatory bombardment, the scale of which had never yet been seen in modern warfare. The battles to win ground from the German Second Army continued over four and a half months and the battle officially drew to a close on 19th November. The Allies won approximately 7 miles (12 kilometres) of ground in that time at a cost of thousands of casualties killed and wounded. The German defence was stubborn and the German Second Army also suffered heavy casualties of many thousands by the end of the battle.